Not what was expected ... but what was? 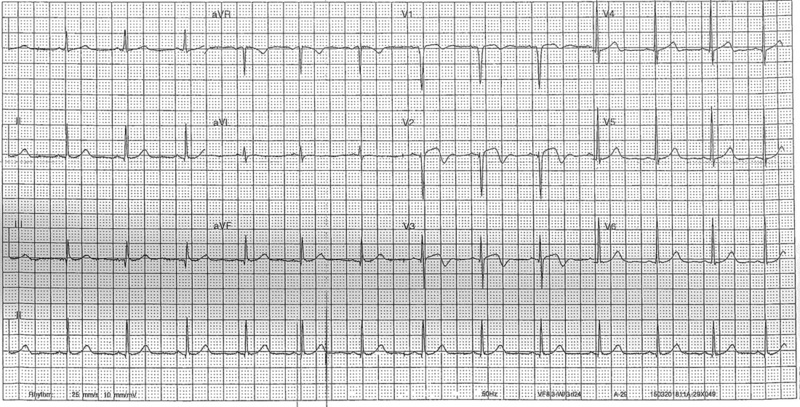 This 31 year old female presented at 12:30 to a sub-tertiary emergency department. Brought in by ambulance complaining of feeling generally unwell with chest and abdominal pains. She had seen her GP a week prior and was diagnosed with influenza. Further history revealed having fevers and sweats and she denied opening her bowels for 2 days and had pain in the RIF. She denied vomiting, previous PID and pregnancy. Triaged Category 3 and assigned to a cubicle. She was seen by a doctor 105 minutes after arriving. On exam she had stigmata of recent IVDU. Abdomen was "soft" with tenderness in the right iliac fossa and hypochondrium. 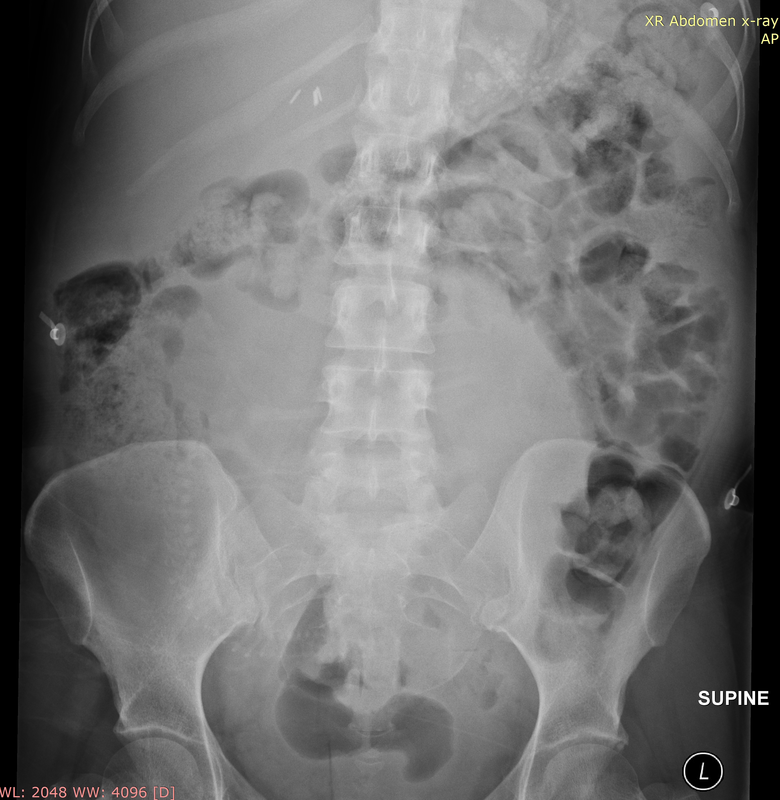 ​As part of her initial work-up she had an abdominal x-ray requested "tro SBO". What is the utility of a plain abdominal film in a patient with sepsis? What abnormality does the image show? This 72 year old man presented by ambulance, to a regional hospital at 4am, acutely short of breath. He complained of having had a cough and increasing dyspnoea for the last 3 days but suddenly worse at 2am. He had recently been diagnosed with COPD after a hospital admission for pneumonia and the paramedics had given him a total of 15mg salbutamol and 1.5mg ipratropium. His initial sats were 77% and he had widespread wheeze but no crackles. He hadn't improved much on the way. 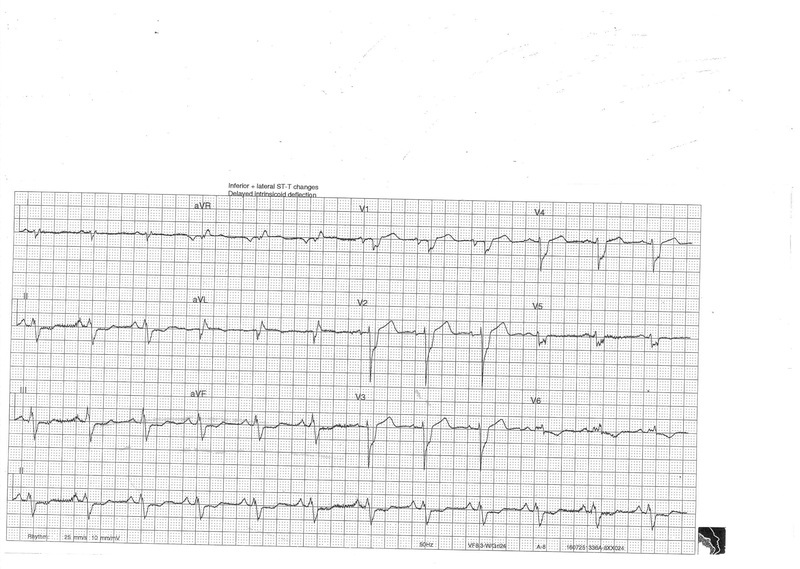 What are the major abnormalities on this ECG? What additional assessment would you perform? 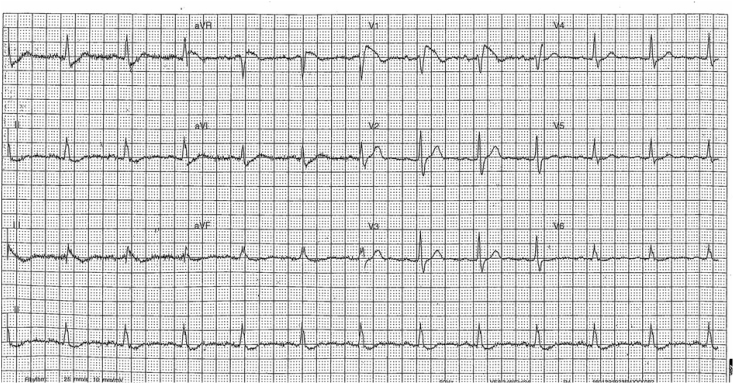 68 year old male presented to the Emergency Department after experiencing an episode of conscious collapse (felt lightheaded initially, sweaty, nausea, vomiting with associated chest discomfort). Was found to have a BBB by AV. 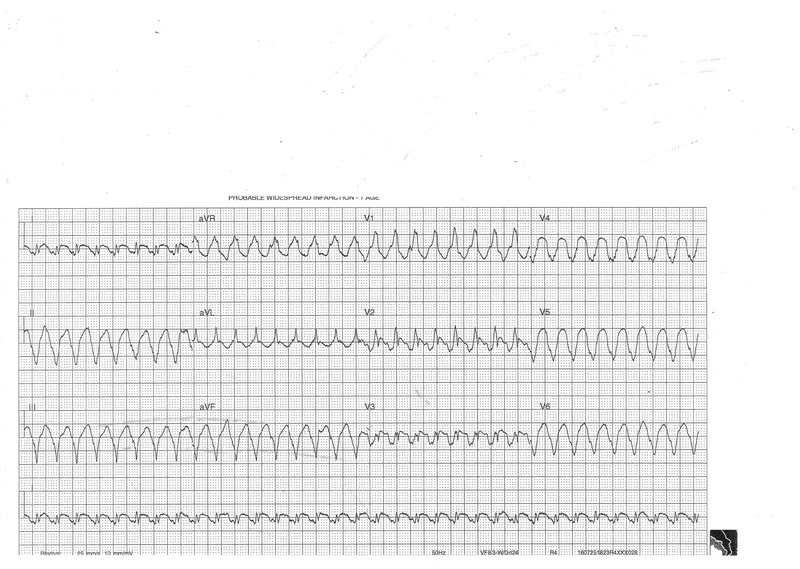 Was stable hemodynamically on initial assessment and the initial ECG is as shown below: (No previous ECG's on records to compare to). Initial troponin was elevated. 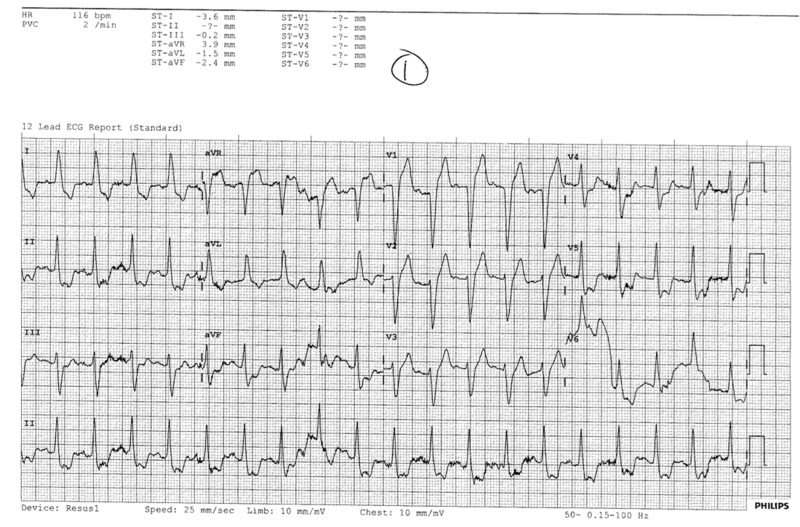 Patient was being cardiac monitored when he was noticed to be tachycardic. ECG is as shown below. Systolic BP was 80/- with the patient conscious and conversing normally with minimal symptoms. So what is the rhythm? How to work it out? While getting ready for sedation/cardioversion,patient became unresponsive with CPR being commenced. Was back to normal conscious state after 15-30 seconds. Repeat ECG was similar to the initial ECG. Thanks to Sashi for the great case! This man presented after two syncopal events at home. He describes sudden LOC and woke without any post ictal phase. He has had no episodes of chest pain. 2. How would you manage this man? ​Stem: 46 year old man presented by private vehicle following an episode of chest pain that has now resolved. No significant pmhx. What would you do with this patient?